On March 4, volunteers and staff from The Cooper Institute® traveled to Austin to educate the 86th Texas Legislature about the importance of building a healthier generation now and Well. Into the Future. Billed as March Forth to the Capitol, the event was held on Dr. Kenneth H. Cooper’s 88th birthday and included a birthday celebration at the end of the day. 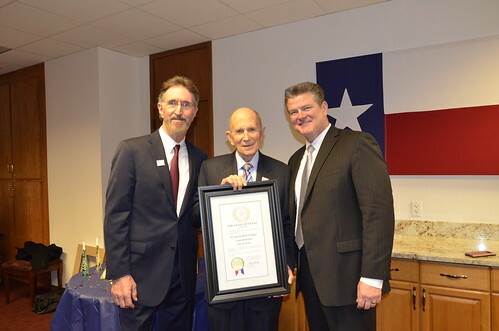 Dr. Cooper pioneered aerobic research and led Texas to be the first state to adopt FitnessGram by The Cooper Institute as the statewide student fitness assessment. Volunteers came from all across the state to urge legislators to continue using evidence-based research from FitnessGram to improve student health and put them on track for a lifetime of healthy habits. This valuable tool is helping turn the tide of childhood obesity by giving school and community leaders the data they need to make the best decisions for student health and fitness. Our volunteers recognize the power of advocacy and grassroots activism. The day started with a luncheon at The Texas Tribune offices across the street from the capitol. Bob Shapard, chairman of the board at Oncor, served as chair of the event and introduced our featured luncheon speaker, Dr. Tedd Mitchell, chancellor of the Texas Tech University System and president of the Texas Tech University Health Sciences Center. Mitchell, who also serves as board president for The Cooper Institute, spoke about how emerging technology over the last 50 years has led to a decrease in physical activity and an increase in health problems at all ages. As a physician and leader of one of Texas’ six state university systems, Mitchell understands better than anyone the importance of preparing students for success. “Our children are the future workforce of Texas and we need them to be healthy so they can be better students now and the best workers tomorrow,” said Mitchell. Following the luncheon, the team “marched forth” to the capitol to meet with representatives and senators. The teams spread out to educate lawmakers on research from The Cooper Institute and other health organizations that show the long-range physical, mental and economic impact of poor health. While Texas is thriving economically, surging healthcare costs could change that trajectory for everyone if we don’t act now to improve public health statewide. Research from The Cooper Institute has helped shape policy and changed lives, but the fight isn’t over. By improving student health today, we will ensure that Texas children are the healthy, productive, and highly-skilled workers of tomorrow and WELL. Into the Future.